Here at D H Complete Cleaning, we offer a number of varied services including carpet and upholstery cleaning, deep cleaning of catering kitchens, flood restoration, high-pressure cleaning and oven cleaning. We can carry out work on commercial and domestic properties, as well as for large companies and businesses or private customers. Another popular service we offer is graffiti removal. If you’ve ever been to a big city, you’ll have seen plenty of graffiti on walls and doors. There are even dedicated places for it in some places. Some cities abroad even have famous alleyways you can visit to see street art, such as Melbourne in Australia. All of our technicians are expertly trained to identify the correct removal technique and products required to effectively cater for each individual job. We’ve been out to help one-off customers, as well as taking care of larger contracts with commercial businesses. When it comes to the actual graffiti removal, some paint can be more stubborn than others. It requires the careful use of specifically selected chemicals to remove the graffiti effectively and without driving the pigments deeper into the surface. Each chemical is gently neutralised. Then, after thorough washing with heated water, the pigments will be drawn from the surface and leave no lasting effects. The team at D H Cleaning is continually researching new removal techniques and products to maintain our high standards and successes. Graffiti can be extremely unsightly. The last thing you want on the front of your business is graffiti. It’s not going to look very welcoming to potential customers! We have also carried out work for establishments such as schools, train companies and councils. So if you’ve tried everything to get that graffiti off of your premises but you’re now at a loss as to what to do next because nothing is working, why not give us a call? Let us do the hard work for you! We know it might just sound like common sense, but one of the biggest causes of fire in an industrial kitchen is equipment not being properly cleaned. Build up of grease is an inescapable fact of a busy commercial kitchen. Unfortunately, the more your business is thriving, the more cleaning that is required! If your industrial kitchen is constantly busy with people coming and going, it’s easy to forget all about regular cleaning maintenance. That’s where we, D H Complete Cleaning, step in. 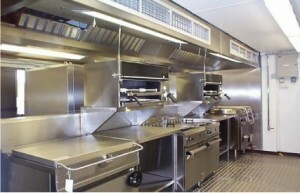 We can look after your kitchen whilst you look after your customers. We will always endeavour to work with you and your requirements and schedules. We can come to you when your industrial kitchen is shut to keep inconvenience to a minimum. For example, weekends or school holidays. We can also start early, work late or even work through the night if this is easier for you and your business. D H Complete Cleaning is a long established, professional cleaning company based in Manchester in the North West. In fact, we have been operating for over 17 years. Our team consists of carefully selected and trained staff. We offer competitive prices and a free site survey, as well as tailor-made services to suit your business needs and we will always supply a certificate of cleaning maintenance. Fires caused by Kitchen equipment, hoods and ductwork can be prevented by regularly getting them thoroughly cleaned by a certified contractor with experience in kitchen exhaust and bare metal cleaning. Of course, you will be keeping your kitchen clean and hygienic on a daily basis as a matter of health and safety. However, this is simply not enough when it comes to a completely clean and hazardous free industrial kitchen. Get in touch with DH Complete Cleaning Manchester and let us relieve the pressure of cleaning and maintenance. After all, you’ve got lots of hungry mouths to feed! We offer a range of services to a variety of clients. Something we are definitely known for is our 17 years’ experience in working with vulnerable people in their own homes. This could be anywhere from communal properties and flats to houses and care homes. It can be extremely embarrassing for strangers to enter your home and see all your private belongings. Many of the vulnerable people we work with struggle to maintain their properties themselves due to illnesses disabilities, or even substance users. Our staff are trained and have many years’ experience dealing with such things and we want to make this cleaning process as dignified and stress-free to the client as possible. We work closely with social workers, family members and the council. No job is too big or too small and D H Complete Cleaning is not afraid to get their hands dirty! This is why we have built up the reputation we have and we have social workers and family members who contact us directly. We offer free, no obligation quotations where we would meet your named person at the property to see what kind of job it is. Each person has their own circumstance and we will match your requirements to this, whether it is to keep the cost as low as possible or to give the deepest hygienic clean we offer. No matter what the extent of the job, each and every client is treated with the same dignity and respect. We offer full deep cleans where each and every corner of the house is cleaned. If needs be we can include rubbish removal, where we work with the clients to see what is to be kept or what is to be thrown. We would ask close relatives, friends or social workers to be there when looking through personal items. However, if the client is happy and confident to do this alone, that is not a problem. We also offer light cleaning in which sides are wiped down and carpets hoovered. This would obviously reduce the cost dramatically, but wouldn’t include moving items around to clean underneath or cleaning anything internally. We do understand that some of our clients are substance uses. We are not here to judge but to get the job done as best we can. If items such as needles are required to be removed and disposed of correctly, we have all the facilities to do so safely. Some items may be soiled with bodily fluids which is also not a problem. Again, we are not there to judge but to only get the job done! There isn’t anything we haven’t seen! Some clients may wish to stay in the property whilst we carry out the clean. That is no issue and we will work around them as best we can without disturbing anyone. Other clients prefer to leave whilst the cleaning process is undertaken. We will take instruction on what to do when the cleaning process has finished i.e keys and contact number. Once all work has finished, we ask that the client, social worker or family member walks around the property and make sure everything is up to standard. Whether it’s a new build or a house which needs renovating, D H Complete Cleaning Manchester can meet any builders cleaning project requirements. We have worked with many clients and developments over the years, completing builders cleans on hundred of plots. This can include windows internally or externally, garden work, re-cleans, sparkle cleans, rubbish removal and much more. As well as covering large developments we also offer one off builders cleans for clients who have recently moved into a property or have recently had work done. For example builders, joiners, painters etc. This doesn’t necessarily just mean house cleans; we offer builders cleans on schools, pubs, hotels and much more. No job is too big or too small. We can send in 2 members of staff to complete a small house or send in 10 staff to complete a whole school builders clean. What do builders cleans, Manchester include? Rid windows and floors of any paint and plaster. Remove all labels from bathrooms, windows, toilets and kitchen. Spot clean of walls and ceilings. Wash all skirting and doors. Clean all kitchen cupboards inside and out. If there is anything that you require that is not on the list above, simply speak to our staff members during the site visit and let them know exactly what you want. We offer a free of charge site visit. Here, we will discuss all your needs. Why choose D H Complete Cleaning, Manchester, North West? We have 18 years’ experience in the builders cleaning industry and have worked for various companies. Our most recent one was Winworth Construction, which we attend on a regular basis to complete builders cleans, re-cleans, sparkle cleans and even brick cleaning to the exterior of the building. All of our staff are CSCS and health and safety tested. We also have qualified IPAF and PASMA drivers. We are extremely flexible, working weekend and nights shifts if needed. We are also available for any emergency call outs. We work around the whole of the North West and no job is too big or too small. How long does the builders cleaning process take? We can only give rough estimations of the timescale of any job as it depends on many factors. For example, the size of the area we are working in, whether there are different tradesmen still working and if our staff members need to be off site at a certain time. If you have a specific time scale, then please let us now on the site walk before work commences and we will do our very best to make whatever you need possible. We may be able to send in extra staff, work later or start earlier. We can even work weekends if necessary. Please call us now for a free, no obligation quotation on 01617635666 or 07974438761. Our staff members are currently on their way to Blackpool, not just for rock, but to deep clean a kitchen in a café! The kitchen clean includes all appliances; walls, ceiling, floor and the extractor system, including the ducting, canopy, filter and extractor fan. First of all we start by de-greasing and cleaning all kitchen equipment. This particular cafe serves a lot of fried food. Therefore a lot of the appliances are covered in a layer of grease. We use a range of cleaning equipment depending on the nature and condition of the job. Today, staff members have taken lemon gel and greasers, which we can provide COSHH and Safety Data Sheets for. We are also big on health and safety and will provide RAMS for all jobs we attend. As well as cleaning products, we also use steam as a form of cleaning. Steaming is a safer option as no chemicals are needed. Steaming is good to use in ovens, dishwashers, tiled floors or walls and extractor systems. Steam gets right in to all the hard to reach areas and is great to use with stubborn carbon or grease marks. Our staff are highly trained in the area of extractor cleaning and we have been trading for 18 years. We can drop the fan or take it apart if need be to clean the area, before putting everything back as we found it. All this is included in your price. With extraction cleaning, grease on canopies, duct work and filters, fire is a real risk. This can be stopped by frequent specialist cleaning. We will also advise you on how often they need to be cleaned. Your clean will also include the issue of a certificate, which can be used as evidence to insurances that you have followed regulations. You will receive a certificate on every clean. What’s more, we will also add all of your details onto our database and automatically contact you in a year’s time when your clean is next due. Canopy filters are also available at £15 each and can be picked up or delivered. We cover all areas of the North West and do night and weekend shifts if need be. We like to accommodate our clients as much as possible to make their life that bit easier. We have a quick and easy form to fill out on our website for any enquiries; just simply fill it out and we will get back to you imminently. As well as filling out our form, enquiries can also be dealt with over the phone. Call us today on 0161 763 5666. If you can take as many pictures of what it is you require cleaning, along with any other information such as the area you are in and your availability for the clean, then we could get the quote over to you straight away. We have recently completed a job at a client’s house where a fire had caused some damage. The walls were covered in a build up of black carbon and the house had a smoky odour throughout. Firstly we completed a free, no obligation quote to see the damage. We then sent over our quotation and the work was accepted. On this occasion, we agreed with the client that we would start work on a weekend for them so that they could leave the house whilst the cleaning commenced. They left us instructions of what to do when the cleaning had been completed so they didn’t have to rush back, making the job as stress free as possible. We started by firstly steam cleaning the walls to loosen the black carbon dust. Then, using a window cleaning blade, we wiped away the black water. We did this a total of 3 times to make sure nothing was left. We tested it by wiping the area when wearing white gloves to make sure no black marks were made when touching it. At the end of the cleaning process, we thermal fogged the whole house. Thermal fogging allows access to hard-to-reach areas and together disinfects walls and the atmosphere. This is a process which also removes any odour. All windows and doors are shut whilst it is carried out. The thermal fog machine releases sprays of pleasant smelling smoke, which in this case was cherry. The fog traps the odours, leaving the house smelling nice and fresh. On this occasion, we only cleaned the occupant’s walls, but we also specialise in the cleaning of carpets and upholstery when fire damage has occurred. We understand cleaning up from a fire can be a very stressful time and we here at D H Complete Cleaning want to help by providing our services as much as we can. We here at DH Complete Cleaning not only offer general kitchen cleaning, but extractor cleaning too. This can be anything from kitchens in schools, care homes, takeaways, restaurants and bakeries etc. Insurances state that your extractor system should be cleaned every 6 to 12 months in order for it to be safe. Leaving your extractor system in a dirty condition can be very dangerous as it can cause fires from the build up of grease. We offer cleaning to the whole system, including the canopy and any filters, ducting, extractor and outlet fans. If the ducting has never received a clean, we would also provide and fit any access doors needed. We do all the measuring so that you don’t need to worry. If any system is unreachable, we can also hire any access platforms to get the job done. Why choose D H Cleaning, Manchester? Not only do we get the job done, but we also provide you with a certificate stating that you have had your kitchen extractor system cleaned. This is good to show your insurance provider to prove you are keeping up with legislation. The certificate is valid for 1 year. But it doesn’t just end there! We will also add all of your details onto our database and automatically contact you in a year’s time when your clean is next due. If you would rather us contact you every 6 months, that is no problem. Just let us know and we will add it to your details on our system. Our system works really well as any small details are saved for the next visit. For example, the extractor fan is in the false ceiling or only arrive at certain times etc. All this make the whole process a lot more personable and easier for yourselves.